There are 47 Assisted Living Facilities in the Prospect Heights area, with 2 in Prospect Heights and 45 nearby. The average cost of assisted living in Prospect Heights is $3,670 per month. This is higher than the national median of $3,346. Cheaper nearby regions include Arlington Heights with an average starting cost of $3,075. To help you with your search, browse the 399 reviews below for assisted living facilities in Prospect Heights. On average, consumers rate assisted living in Prospect Heights 4.0 out of 5 stars. Better rated regions include Arlington Heights with an average rating of 4.3 out of 5 stars. Caring.com has helped thousands of families find high-quality senior care. To speak with one of our Family Advisors about assisted living options and costs in Prospect Heights, call (855) 863-8283. Prospect Heights is an ethnically and economically diverse city that is highlighted by half-acre homes, beautiful parks and woods, and an increasing number of restaurants and businesses. An up-and-coming suburb of Chicago, Prospect Heights has a population of just over 16,000 people, with 16 percent of residents age 65 years or older. To accommodate seniors who may need support with personal care and medication management, there are two assisted living communities within city limits, and an additional 48 facilities available in surrounding towns. In Prospect Heights, and the rest of Illinois, assisted living facilities are regulated by Illinois Department of Public Health. Prospect Heights experiences all four seasons, with weather conditions ranging from pleasantly mild to extremely humid — or quite cold. In the winter, Prospect Heights averages 37 inches of snow per year, and the daily highs are often below freezing. Activities for seniors may be more limited to the indoors between December and February. The cost of living in Prospect Heights is about 14 percent higher than the national average, with housing and transportation accounting for the biggest cost differentials. Prices for groceries, health care and utilities in the area rank slightly lower than the national average, which makes Prospect Heights a relatively affordable Chicago suburb for seniors. Compared to all cities and towns with a similar population, Prospect Heights is one of the safest places for seniors to live in America. The property crime rate is below average and violent crime is well below the national average, with a rate of one per 1,000 residents. In addition to Pace Suburban Bus service, Prospect Heights is served by Metra’s North Central rail line for travel north up to Antioch and south to Chicago Union Station. Seniors are eligible to use the Regional Transit Authority’s reduced fare permit for trips on Pace, Metra or the Chicago Transit Authority (CTA). The Prospect Heights area is home to world-class medical facilities, including Northwest Community Hospital, NorthShore Glenbrook Hospital and Advocate Lutheran General Hospital, in the event of medical emergencies or illness. Prospect Heights has an array of community resources for seniors, including the Prospect Heights Park District, which offers Bridge, Bunco, nature tours, theater outings and other social activities through its Active Adult programs. Assisted Living costs in Prospect Heights start around $3,670 per month on average, while the nationwide average cost of assisted living is $4,000 per month, according to the latest figures from Genworth’s Cost of Care Survey. It’s important to note that assisted living rates in Prospect Heights and the surrounding suburbs can vary widely based on factors such as location, the level of care needed, apartment size and the types of amenities offered at each community. 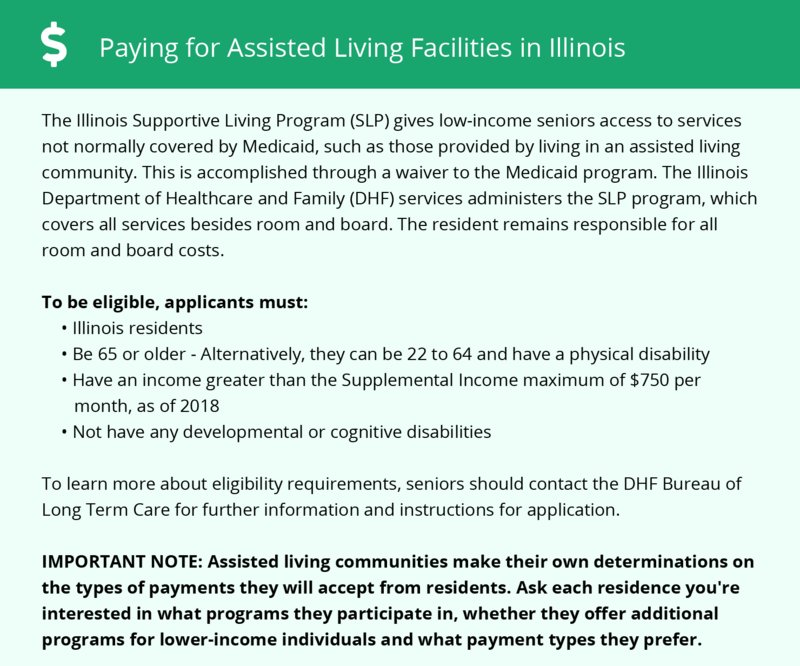 In Illinois, the HCBS Medicaid Waiver for Supportive Living Facilities helps eligible seniors pay for care services in some assisted living communities but not room and board. Prospect Heights and the surrounding area are home to numerous government agencies and non-profit organizations offering help for seniors searching for or currently residing in an assisted living community. These organizations can also provide assistance in a number of other eldercare services such as geriatric care management, elder law advice, estate planning, finding home care and health and wellness programs. To see a list of free assisted living resources in Prospect Heights, please visit our Assisted Living in Illinois page. Prospect Heights-area assisted living communities must adhere to the comprehensive set of state laws and regulations that all assisted living communities in Illinois are required to follow. Visit our Assisted Living in Illinois page for more information about these laws.